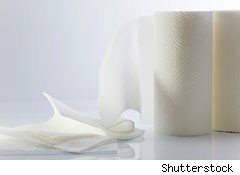 Paper towels are convenient for cleaning, but they come at a cost. Even though they're easy and disposable, buying these absorbent rolls can add up over time. Here's how you can save and keep your home sparkling clean. The average family uses two rolls of paper towels per week, and at $14 for an 8-pack you could be spending up to $182 a year for that convenience. Instead, consider dish towels. A 4-pack of dish towels by Walmart's Mainstay brand costs $5.48, which means you're only spending $1.37 on each reusable towel. For even more savings, head over to the automotive department where you can score a 10-pack of cotton blend shop towels for just $3.47. That's under 35 cents per towel! Since they're heavy duty, they should last you a while. Even with the cost of washing them, these towels will still offer $172 in savings over buying paper towels. So, when it comes to cleaning your home, ditch the paper products. Reusable towels are not only better for the environment, they'll save you a bundle, too.